Teaching descriptive writing is an exciting process. It's a word playground ... playing around with words, making better substitutes, imagining a scene or character in detail and then expressing it in concrete terms. But how do you really begin? After reading aloud for many years, your children will have heard wonderful examples of descriptive writing and so the next logical step is that they learn how to replicate what the 'great' authors do! So... how do we do that? Show off the best authors and learning from their writing styles! It's all about using a modeling approach to writing. Teaching descriptive writing using the Modeling approach is an exciting way to explore descriptive writing techniques used by different authors - and then put that same technique into practice. It is simple, yet, so effective! What descriptive writing can I use as models? How can a Character/ Place/ Object be described? Is there a tool which can help me? As I began to teach my children how to write descriptively, I created a number of ebooks which go through that exact process. First, we read from the authors; Then, we examine what they have done - and then we apply it. Modeling the Classics - Teaching Descriptive Writing does that! In this ebook you will find excellent models of descriptive writing, followed by questions which help the reader identify the author's techniques. Then, using graphic organizers, the student creates his/her own descriptive writing based on the model. Once you have used this ebook, you will easily be able to apply the same techniques to all sorts of literary passages and continue teaching descriptive writing on your own. Modeling the Classics aims to encourage children to model their own writing, on styles of authors which they already love. Models of excellent literature from Bambi,The Trumpet of the Swan, Paddington Bear, The Hobbit, The Bronze Bow, Brambly Hedge, Wind in the Willows, Charlotte's Web, Little Britches, Heidi and more. Models of descriptive writing of a person/animal; Step by Step guide to write descriptively based on one of the models. Four other models for practice. Models of descriptive writing of a place; Step by Step guide to write descriptively based on one of these models. Four other models to be used for practice. Models of descriptive writing of an object; Step by Step guide to write descriptively based on one of these models. Four oOther models to be used for practice. Printable handwriting pages (various sizes to choose from) to copy the models. Graphic Organizers to help the writer. The last pages of this e-book contain the information on my website about using Stylistic Elements to teach descriptive writing, followed by some graphic organizers. Download the 290+ pages onto your computer right now! Is it directed to the child or adult? Both. The ebook is written to the child and is written to help both the parent and child view a passage of literature, extract all the prepositional phrases to bring the writing to the barebones, write a simple list of keywords or phrases, and then work with the words and using the similar style used by the author, add interesting phrases, adjectives, verbs and adverbs. The ebook assumes a certain level of understanding of grammatical terms and so younger children will need help initially from the parent/teacher. However, as similar steps are used again and again, the children will readily understand what needs to be done. My 8 year old understands what to do when I say, "Bring it to the barebones." What if the parent/teacher is not familiar with grammar? The Descriptive Writing Ebook is scripted and terms are explained and easy to understand. The parts of speech in the step by step guides are even colour-coded for easy understanding. What age does it cover? How do I use this ebook? Remove all the flowery, descriptive parts out of the passage so you are left with the barebones of the passage. Write an outline of the description. Use only a few keywords. Students are helped to do this through step by step instructions. The keyword outline is now build upon. The scripted lesson helps the student understand how to add interesting verbs, dual verbs, nouns, pronouns, adjectives, adverbs and create an interest filled paragraph. Graphic organizers are also used. In this step the student reviews their paragraph and is encouraged to improve sentence openers, using prepositional phrases, adverbial and adjectival clauses, metaphors and similes and dialogue. Four extra models are provided for extra practice to develop descriptive writing in these categories. However, only one of them is written as a scripted lesson. In total there are 3 models with scripted, detailed lessons and another 12 models of literature (4 in each category) with 4-5 questions which will help the parent discuss the passage with the child. Does it cover all of the Language Arts? No. 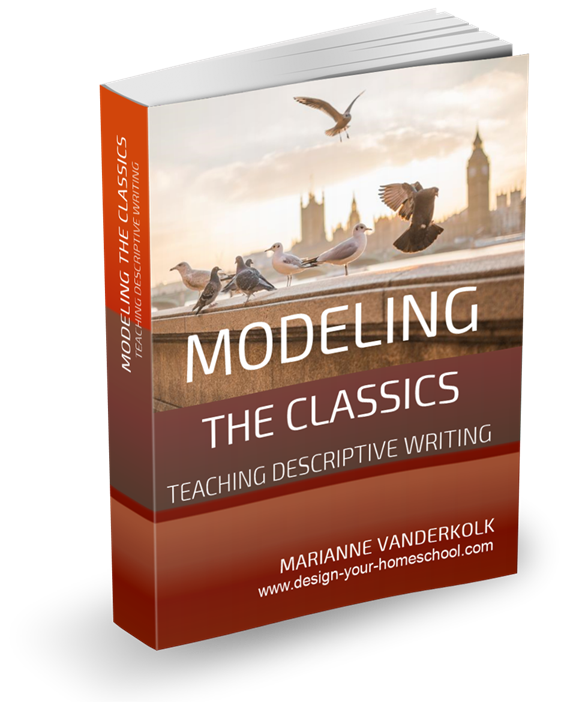 This ebook uses a basic outline of teaching descriptive writing using a model from Literature. Spelling or dictation is not scripted in the lessons. Grammar is taught in the context of removing and adding parts of speech to create descriptive writing. It is easy, however, to add dictation and spelling from these literary passages, but Spelling lists or suggestions are not included. If you would like to understand how to add Spelling and Grammar lessons in the context of literature studies, follow the steps on the Language Arts Lesson Plans with Literature page. Enjoy learning from the best and modeling the classic authors and their styles. If you really love literature and getting right involved with the text as well as in the context of the novel - you will love LitWits Kits!